Definition at line 28 of file file.h. Definition at line 142 of file file.c. Definition at line 186 of file file.c. Definition at line 84 of file file.c. 94 printf("Invalid character in name. Use \\ooo for special "
Referenced by file_add(), and rename_file(). Definition at line 230 of file file.c. Construct the "pretty-printed" representation of the name in a short directory entry. Pointer to static string containing pretty "8.3" equivalent of the name in the directory entry. Definition at line 58 of file file.c. Referenced by file_modify(), report_unused(), test_CreateFile(), test_file_all_name_information(), and test_file_name_information(). Definition at line 221 of file file.c. 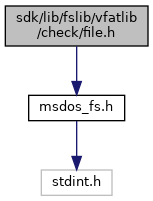 Referenced by add_file(), CVfdShExt::DoVfdDrop(), map_acemask(), map_dacl_2_nfs4acl(), OnImage(), OnTarget(), Open(), PrintImageInfo(), Save(), UpdateImageInfo(), VfdImageTip(), and VfdOpenImage(). Definition at line 269 of file file.c. Definition at line 32 of file file.c. Referenced by file_add(), file_unused(), and scan_root().